Picture taken at Laurel Frairgrounds about 1952 and donated by Jason and Bud Walters. As told by Mike Kimble: Although tied to the town of Wesson in many race fans’ minds, Ben Adams actually lived in Brookhaven, Mississippi. Originally he was a winning driver in the 1950’s with his Modified #99. Ben became best known over the years as the owner of the #99. In the 1960’s three other men, Riley Kimble, Hascal Lowery, and Nelson Smith, joined Ben in owning the #99 and creating the Wesson Racing Club. In the late 60’s this team moved to asphalt where Ikey Jerome drove their innovative upright and rear engine Supermodifieds with much success. Below is an email conversation that I had with Ben Adams' daughter in May 2006. Tobby: Does anyone know who named Ben Adams car “Steppingem” and what does it mean ?? Debbie Keene: Hello Tobby. I'm Ben Adams daughter Debbie Adams Keene. Pat Barrett gave me your email address. I did not name the car, I painted the Dennis the Menace on the sides one time. Daddy told me he saw a black man with a log truck and it had “Steppingem” on the side. He asked the man what it meant. The man said, "Mr. Ben, she's a steppin' gem." Daddy thought that was funny and decided to paint it on the side of the race car. It's pronounced just like it looks. 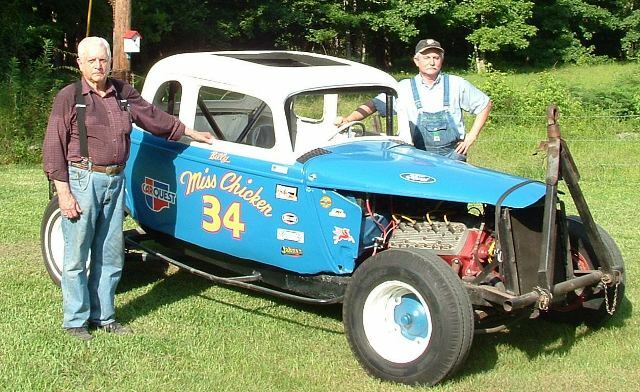 By the way, the car (Miss Chicken) you guys got from Johnny Baker, somewhere in the archives of my pictures I believe I have one of Johnny in that very car when HE owned it. If I come across it, I'll let you know. He was so tall; his head is almost sticking out the top. Daddy worked up there on Hwy 49 when I was in the third grade with Johnny at Dixie Used Parts, drove back and forth and then got the opportunity to open Wesson Auto Parts. Man, talk about ancient history. Enjoy your website!! Keep it up!! Email me if you have any questions, most likely I've heard it before. Tobby: Why did your Dad paint Dennis the Menace on the car ?? Did it have anything to do with Ikey Driving it ?? Debbie Keene: Hmm, Daddy just liked Dennis the Menace and he knew I could draw and paint. He actually wanted a picture of Wylie Coyote catching the Road Runner and paint "Beep, Beep, Hell !" on it. Tobby: I love to hear stories of those days. What is you favorite story about your Dad. Debbie Keene: Daddy had a brother named Bunk Adams that loved to fish. His real name was Z.T. Adams (as in Zachary Taylor) but he was always known by Bunk. He didn't care a THING about racing and Daddy didn't care a THING about fishing. Somehow Daddy talked my Uncle Bunk into coming to a race. Dad took two cars that night. His quickest car got in an accident early in the evening and was done for the night. Daddy and Uncle Bunk took the motor out of both cars, switched them and won the feature race. Talk about trusting each other to tighten all the bolts!!! Daddy always said his brother was the better of the two in mechanics! Oh the stories I know!! I asked my father one time how he knew SOOOO much about cars. He said, "Well, I would try something and if that didn't work, I didn't do it like that the next time." He could have been another Will Rogers with his dry humor. Only, I don’t' think he was kidding most of the time. He said his mother told him he was "cut out to be a doctor but they sewed him up wrong". I don't know where the race was that they switched engines, someone else may know, but I grew up with that story so it has to be old. There’s another story about how he went from driving to building race cars. They were racing in Laurel and he had a wreck and they rushed him to the hospital. My mother was inside the pits and couldn't go until the races had ended. Someone (not thinking) hands Mom his bloody helmet. By the time she gets to the hospital, she was scared and very mad. Daddy said, "my old head was thumpin' and she leaned over to me and says, ‘you can either find a new hobby or a new wife'. Well they were married 41 years when he died! I've got plenty of stories; you tell me when to stop. Thank you for your interest!!!! !